SAN DIEGO -- Big waves will pound parts of the San Diego County coastline Thursday as strong rip currents swirl off the coast, but calmer seas are expected tonight. 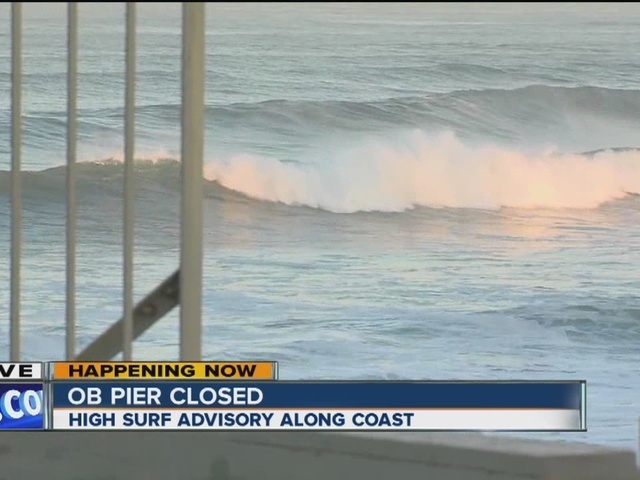 San Diego Lifeguard Services reported that the heavy surf closed the Ocean Beach Pier this morning. A National Weather Service high surf advisory was set to expire at 10 p.m. The surf is expected to build to 5 to 10 feet with sets to 12 feet by this afternoon as a west-northwest swell peaks. Forecasters said the highest surf would likely occur south of Solana Beach. "Surf should pick up this morning at SoCal beaches, with occasional sets possibly as high as 12 feet in southern San Diego County and northern Orange County," according to the weather service. "Strong rip currents will also be likely." The waves may be high enough to top jetties or sea walls and may even reach the top of the Ocean Beach Pier, forecasters said. Minor beach erosion will also be possible throughout the advisory period. The surf is expected to subside tonight, but a second swell is expected to lead to similarly high surf and strong rip currents this weekend.